A4 (210 x 297mm) posters fit within frame in portrait or landscape format! 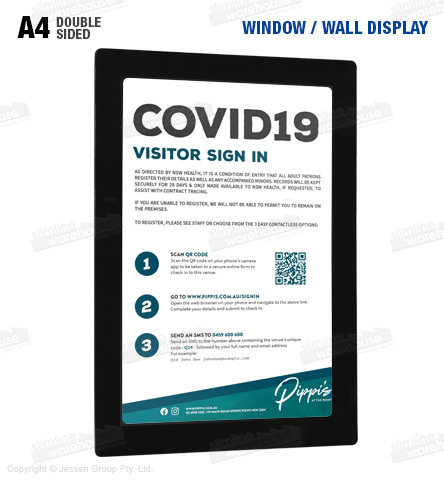 This stick on signs for glass doors displays an A4 (210 x 297mm) in portrait or landscape orientation,making it easy to create promotional materials that best suit your layout and design. The window display can be used as a single or dual sided display based on where you install it. This poster frame is perfect for use on windows or glass doors to maximise your reach to potential customers! The stick on signs for glass doors, like poster frames, is a self sticking display that requires no tools for installation. Self adhesive dots strongly attach to any non porous surface to hold the signage holder in place. Once attached, the dots are invisible for a seamless look. The dots are only meant for a one time use, and may not reattach of using a second time. The glass mount sign holder features interior magnets to hold the sides of the frame together. This makes poster changes fast, with the sides simply being lifted up, posters switched, and then let the sides reattach. Order this display by 2pm EST to receive same day despatch to Sydney, Adelaide, Melbourne, Brisbane, Perth, and anywhere else Australia-wide!